It is time once more for a PinkFae archive. This one is another board game review that I wrote for that site. This article was originally published on 27 March 2016. The time has come once again for a board game review. This week, I shall look at a new game that was only just recently published, with the help of Kickstarter, and was introduced to me by my good friend John Trobare. 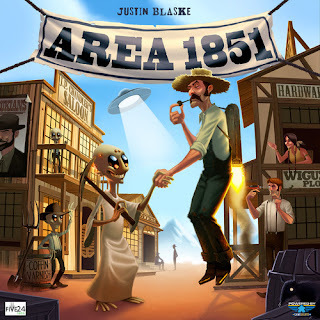 The game in question is: Area 1851. It is a game of 'UFOs meet cowboys.' 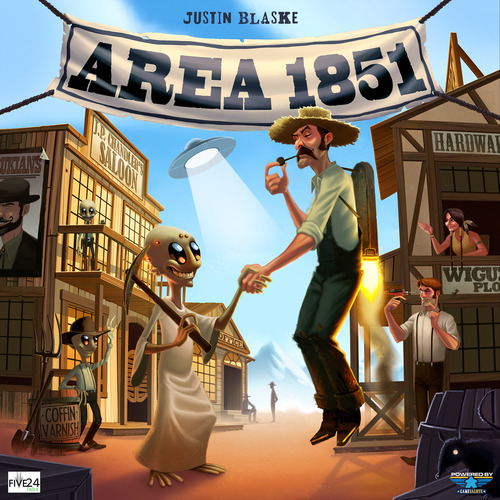 Aliens and old west characters are competing to gain the greatest amount of reputation by constructing and delivering strange devices. As always, we start with some numerals that are not at all randomly generated. Once more, it is time to provide you with an inclusive NPC. If you want to include a wider array of characters with whom your PCs may interact, you are free to use the characters I describe here. You may use them as they are written, or you may adapt and modify them to meet your needs. As always, I provide stats in the D20 system, GURPS, the original World of Darkness, and Fate Core. If you would like to use these characters in a different system, you are welcome to do so; just convert the stats using whatever method is best for you. This week, our NPC is Chadra. She is a muslim of Syrian nationality, though she moved when she was younger to whatever location you need for your game. Her background is somewhat tragic; she was discovered at a fairly young age (somewhere around 13 or 14) by a woman named Tamsin, who claims to have had a vision of the future. In this vision, an apocalyptic event was destined to occur, in which hordes of demons swarm across the world, killing everyone in their path. Tamsin insists that the only way to survive this cataclysm is to offer sacrificial victims to these demons in exchange for her own life. Tamsin recruited Chadra into this cult and had her trained as her enforcer. The young girl was taught to be proficient with a number of melee weapons, most notably the sword. Do Lizardfolk Females have Breasts? I know, that's a very strange title for an article. Bear with me though. See, I was working on a prop for the new Fate game I'm running. It's sort of a crossover between Shadowrun, Call of Cthulhu, and Cowboy Bebop. But the important thing is that I was looking for images of lizardfolk to use in this prop. And I noticed that many of the images I was seeing displayed breasts on the females. This struck me as odd, because reptiles don't have breasts. Breasts are a uniquely mammalian feature; in fact, that's where the word 'mammal' comes from: the Latin word mammalis, 'of the breast.' No other type of animal has mammary glands. I really enjoy watching the video reviews over at Shut Up and Sit Down. They're detailed, they're well done, and most of all, they're amusing. But one thing I've noticed is that I often disagree with them. They usually recommend games that I would not, and they frequently don't recommend games that I think really deserve to be recommended. Which, as I've said many times in the past, is fine; everyone likes different things from their games. But I was especially disappointed when they didn't give a recommendation to Near and Far. So my friend (who, you may remember, I'm calling Caroline) bought a copy of Near and Far and told me that I should play with her. Thus, the Dork Spouse and I traipsed over to the home of Caroline and her wife one evening, and we set up the game. We watched through a 'how to play' video, and then we began the game.